The European Federation of the Parquet Industry (FEP) estimates, as a preliminary forecast, that the overall consumption figures of the European Parquet Industry for the year 2018 have moderately contracted by a bit less than 2%. After three years of moderate growth or stabilisation, and despite a generally good start of the year, the consumption figures of parquet in Europe downturned for 2018. A drop close to 2% is forecasted for the whole year. As was witnessed in the past, the results show some variation from country to country, FEP explains. The market contraction is mainly due to decreases of parquet consumption observed in Germany, Switzerland and the Nordic market (Denmark, Finland and Norway) as a whole. The Nordic market remains volatile with regional differences reflecting the evolution of residential building activity. Finally, France and Benelux are also reporting declines in consumption. On the contrary, parquet market continues to improve in Austria, Italy and Poland, while it is stable in Spain and Sweden. Complete market data will to be communicated at FEP’s annual General Assembly mid-June in Lisbon, Portugal. 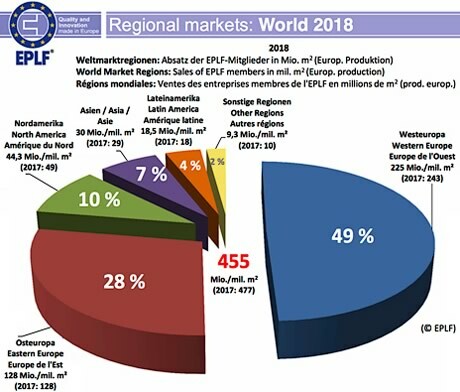 In 2018, manufacturing members of the EPLF achieved worldwide sales of European-produced laminate flooring totalling 455 million m² (2017: 477 million m², which corresponds to -4.6%). In Western Europe, the ‘home market’ of the EPLF, sales declined further in 2018, whilst Latin America and Asia once again recorded the biggest increases. North America saw a reduction in sales, whereas Eastern Europe remained stable. In Western Europe (including Turkey), total sales reached 225 million m² in 2018 (2017: 243 million m²). This represents a drop of -7.3% compared to the previous year. Germany was still by far the most important individual market in Central Europe with 52 million m2 (2017: 57 million m²) – albeit with a -8.3% reduction caused by the continuing trend towards substitution with alternative flooring types, EPLF explains. France continues to occupy second place in Europe, declining slightly in 2018 with 36 million m² (2017: 37.6 million m²). The positive trend for EPLF members did not continue in the United Kingdom: at 29.8 million m² for 2018 (2017: 33.8 million m2), a further reduction of -11.8% was recorded. This puts the UK in third place again for sales in Western Europe – ahead of Turkey, where laminate revenues for the association continued to decline in 2018, falling -18.2% down to 20.4 million m² (2017: 24.9 million m²). The Netherlands remains in fifth place with sales figures of 18.3 million m² (2017: 19.7 million m²). Once again, Spain follows on behind with a stable outcome of just under 16.5 million m² (2017: 17 million m²). In Eastern Europe, although the upward trend of the previous years cannot continue, its stable result, according to the association, means this region will nevertheless continue to be an important market for EPLF producers in future. Sales within the area reached around 128 million m² (2017: 128 million m²) in 2018. The EPLF is aware that in 2017 just under 28 million m² of laminate produced by Russian members was not covered by the statistics for various reasons. In 2018, EPLF members in Russia reported sales of 39 million m² (2017: 36 million m²), which corresponds to a growth rate of 10.6%. Poland achieved a consistent result in 2018 at over 29 million m² (2017: more than 30 million m²). Romania exhibited a slightly weaker outcome, however, with 11 million m2 (2017: 13.2 million m²). Behind Romania, in the same order as before, are: Ukraine with 7.6 million m² (2017: 7.4 million m²) i.e. +4% growth, Hungary at 7 million m² (2017: 6.5 million m²) and Bulgaria with 4.4 million m² (2017: 5 million m²). At 44.3 million m² (2017: 49 million m²), total sales for North America in 2018 stand at around -10.4% down against the previous year. With around 30.7 million m² sold in 2018 (2017: 32 million m2), the USA exhibited a slight reduction of -2.4%, whilst Canada recorded just under 13.6 million m² for 2018 (2017: 18 million m²), representing a drop of -24.5%. The biggest increase in 2018 was 7.8%, gained in Africa, although total sales there only amounted to 5 million m². 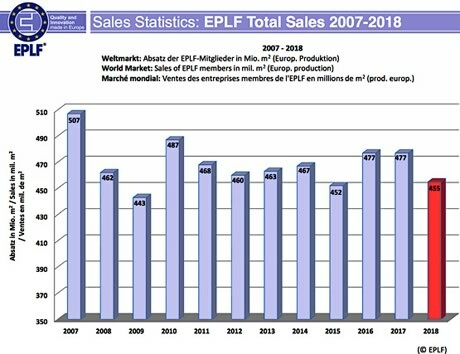 The region of Latin America again recorded an increase in EPLF sales statistics, achieving a growth rate of +4.7% for 2018 with 18.5 million m² (2017: 17.7 million m²). Sales figures for Chile, the largest individual market, rose by +5% compared with the previous year, standing at 8.1 million m² (2017: 7.7 million m²). Mexico recorded 3.9 million m² (2017: 4.3 million m²), Columbia registered 2.1 million m² (2017: 1.6 million m²), and the poor economic situation in Argentina led to a downturn to 1.5 million m² (2017: 2.1 million m²). In the Asia region, EPLF producers achieved total sales of around 30 million m² (2017: 29 million m²) in 2018, representing a rise of around +2.8% over the previous year. The number one position for Asia in 2018 was again held by China (including Hong Kong), although figures were down -7.2% compared to the previous year: sales there reached 8.9 million m2 (2017: 9.6 million m²). The EPLF is encouraged to see ongoing growth in Kazakhstan, where market data has been gathered since 2016: 4 million m² sold (2017: 3.6 million m²), an increase of +11%. Israel attained 2.3 million m² (2017: 2.2 million m²), Saudi Arabia rose slightly with 2.9 million m² (2017: 2.7 million m2); behind this lies Uzbekistan with nearly 2.1 million m² (previous year 0.8 million m²) followed by Taiwan with 1.7 million m² (2017: just under 1.8 million m2) and Azerbaijan with 1.6 million m² (2017: 0.9 million m2). Meanwhile, it appears laminate has also gained a foothold in the huge Indian market: in 2018, EPLF members achieved sales there of 1.6 million m² (2017: 1.4 million m²). 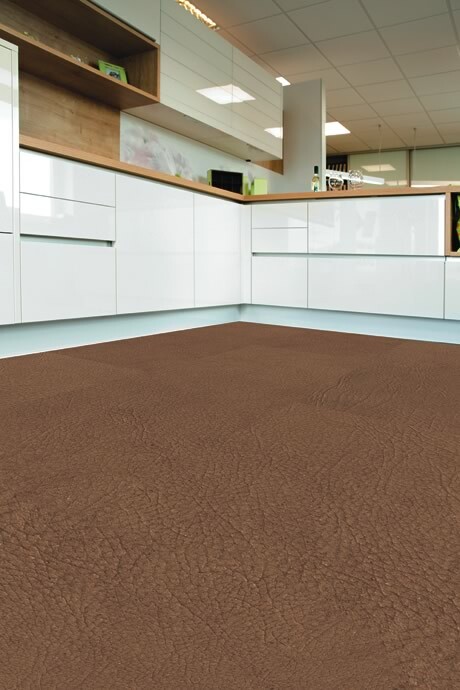 Sales figures for members of the Multilayer Modular Flooring Association (MMFA) continued to rise in 2018, and in 2019 the association forecasts continuing sales growth for all product categories and markets within the modular multilayer flooring (MMF) segment. For MMF flooring with HDF core, the association currently estimates that its members hold a world market share in excess of 90%. By 2017, MMFA producers had already achieved global sales in this category of almost 10 million m2, of which 80% were accounted for by Germany, Austria and Switzerland. In 2018, the total quantity rose to 12 million m2. For modular multilayer products based on polymer or polymer composite, MMFA members worldwide achieved sales of 62 million m2 in 2018 (2017: over 48 million m2), of which more than 31 million m2 (2017: 23 million m2) came from Western Europe and around 26 million m2 (2017: 21 million m2) from North America. In 2018, MMFA members in Germany achieved sales of wood-based and polymer-based products amounting to nearly 20 million m2 (2017: just under 15 million m2) – continuing the upward trend. Last november, members of the MMFA agreed to reclassify the various MMF product groups. The category ‘Wood’ (previously Class 1) applies to products with a wood-based core. The category ‘Polymer’ (previously Class 2) includes polymer-based and polymer composite-based substrates and is divided into heterogeneous, (semi-) resilient LVT Click products (mostly in accordance with EN 10582) and the more stable Rigid products (usually in accordance with EN 16511). ‘Rigid’ includes polymer Click products based on either EPC (Expanded Polymer Core – polymer foam middle layer) or SPC (Solid Polymer Core – high-filled middle layer). Lastly, the category ‘Mixed’ includes all other types of construction (previously Class 3). In all three categories, the polymers can be either PVC or other synthetic material alternatives.